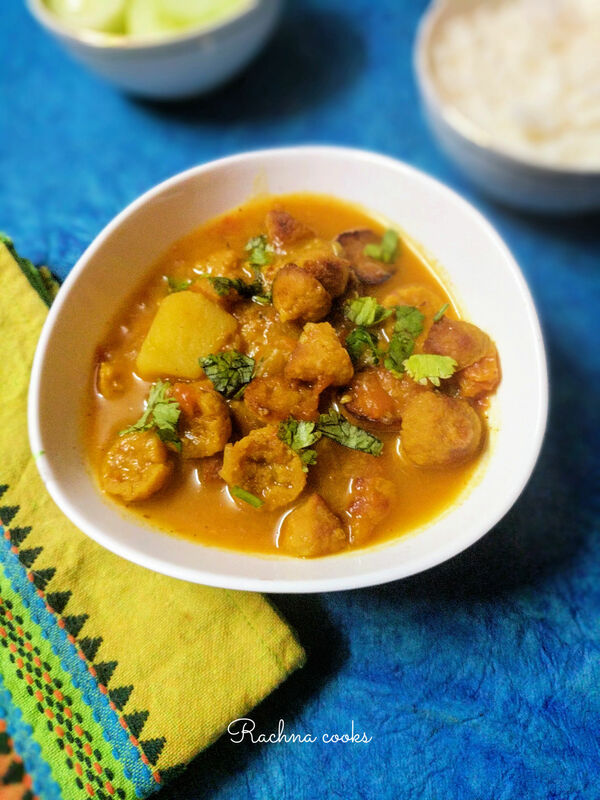 This is a tasty home style mangodi aloo ki sabzi made with moong dal or split mung beans. It is tasty and nutritious and makes for a perfect meal. Lightly toast mangodi on a tawa till they are golden brown. You may use a little oil if you wish to. Heat oil in a pressure cooker. Add cumin seeds. Let them sputter. Add chopped onions, ginger garlic and green chillies. Saute till they are golden brown and the raw smell goes. Add tomatoes and cook some more till mushy. You can add a little water if it looks too dry. Now add the toasted mangodis along with cubed potatoes. Add all the spice powders including salt. Stir together for 2-3 minutes. Now add 2 cups of water and close the pressure cooker. Cook for 3-4 whistles till mangodis are well cooked and potatoes are creamy. This is a rustic style home curry that is super tasty. Serve it with a side of onions in lemon juice and some boiled rice or chapatis. You can skip chilli powder if you want it milder.